The Arcelor Mittal Orbit: An Olympic Eyesore? Not content with spending £9 billion to stage the Olympics, about which we can debate the merits of potential social and economic regeneration of a poor and depressed area, Boris Johnson and Tessa Jowell have now decided to spend a further £19 million to create a landmark on the site of the Olympic Park in Stratford, the grimly named ‘ArcelorMittal Orbit’. Apparently this is designed to draw visitors to what is implicitly feared will become another Olympic white elephant. Almost every Olympic site has become neglected and virtually redundant after the two-week games have finished. Does this Stalinist scale folly reveal that this vastly expensive project will become an abandoned wasteland without a fair ground ride to draw in visitors? Computer generated images suggest a tower made from Meccano, which I remember from childhood that allowed you to make fantasy structures from bolted together strips of painted steel. Rising above a large, windswept piazza, the ‘Orbit’ might well become a bleak and isolated destination. This giant folly, taller than Big Ben will apparently act as an observatory. But offering a view over what exactly? The new shopping centre at Stratford? Empty sports arenas? Post-industrial garbage dumps and clogged canals? This is a vanity project once familiar from Soviet occupied Eastern Europe. At least the London Eye has one of the best views in the world across the Thames to historic Westminster. The ‘Orbit’ resembles Portsmouth’s Spinnaker Tower, another council-led attempt to build a ‘landmark’, but bereft of ideas. 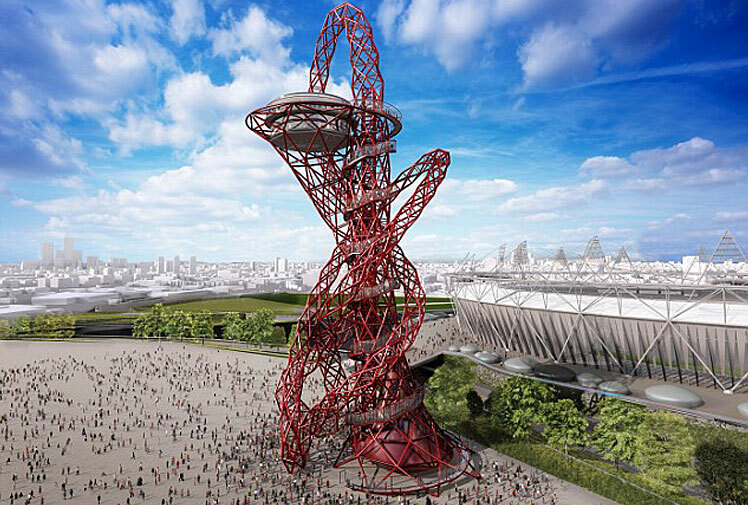 Anish Kapoor is capable of making some sublime sculpture that explores our bodily encounter with materials and space but this helter-skelter, kitsch Tower of Babel commissioned by bureaucrats and named after multinational is an unworthy mistake. It has none of the suggestive power of Kapoor’s ‘Marsyas’ formerly installed in Tate Modern’s Turbine Hall. Imaginative and engaging public sculpture is a necessary feature of our shared civic space but this awkward, outsized and confusing fair ground attraction seems a serious waste of money even if most of the costs come from the pockets of a benefactor. What’s more troubling is the apparent confusion about how to create a valuable legacy for the Olympic Games and how to commission public art of genuine and enduring value.